I have seen and met Hugh Herr. I had first seen him on an episode of Scientific American Frontiers where he was showing some of the technologies he had developed for the physically challenged. When I first met him, I was struck by his intelligence and soft spoken manner. I never looked at his gait. I had no reason to. When I was asked to, I wondered why. There was nothing particularly extraordinary about it. He had a slight swagger but nothing that stood out. Later I learned that he was a double-amputee, and was testing out biomechanic prosthetics on himself. 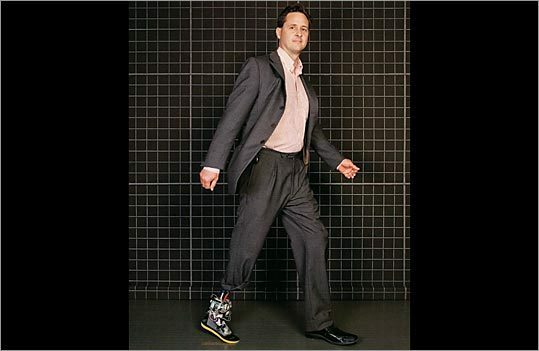 Herr is a professor at the MIT Media Lab, where he heads a biomechantronics (biology, mechanical engineering and electronics) group designing prosthetics for the handicapped. Earlier this year, his research helped truly level the playing field for an Olympic athlete. For the first time this year, an athlete with an artificial foot was able to compete in a track event alongside able-bodied athletes. Read the story here.